VANCOUVER, Jan. 29, 2018 /CNW/ - Awalé Resources Limited ("Awalé" or the "Company") (TSXV: ARIC) is pleased to announce the granting of a new prospective gold permit 'Amélékia', in the Comoé district of south eastern Côte d'Ivoire. The permit is the first granted of three Awalé applications, forming the Company's Abengourou Project (Figure 1). "The granting of the new gold prospective Amélékia permit in the Abengourou Project area is an important step for Awalé. It complements the Company's strategy of amalgamating permits to form project areas with significant exploration scale and potential, combined with a broader focus on the east of Côte d'Ivoire. In close proximity, to the north, we have the more advanced Bondoukou Project where initial scout drilling has recently been completed. The key for Awalé is ensuring and managing a pipeline of gold projects in Côte d'Ivoire offering district scale, which has now been achieved. We look forward to keeping the market informed of our progress and pending drill results from Bondoukou." The 375km2 permit is prospective for gold mineralisation and forms the south western 'Côte d'Ivoire' extension of the Sunyani Basin from Ghana, interpreted extensions the Sefwi Belt contacts lie close to the permit area. Newmont's Ahafo gold mining district is located on the Sefwi Belt, close to the Sunyani Basin contact. Parts of the permit area were formerly held by Golden Star Resources and legacy data on this project area has been retrieved by the company. Data retrieved from this period of activity includes over 100 stream sediment samples, over 7,000 soil and auger geochemistry samples along with rock chip sampling and limited pitting. 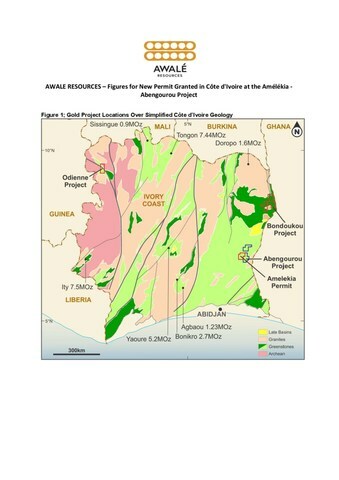 The work completed covers the greater portion of the Amélékia permit area revealing anomalous gold geochemical trends and soil anomalies that are parallel to the regional structural trends as seen in geophysics and government mapping (Figure 2). Strike lengths of these anomalies trace up to 10km in the south of the permit area and 6km in the northeast, other shorter strike length anomalies are also apparent. The permit is 100% held by Awalé through its local subsidiary Awalé Resources Côte d'Ivoire. Original lab reports for the data obtained and details on quality control sampling are not yet available to be verified by Awalé. However, the data gives the Company initial focus areas to assess and complete due diligence sampling and geological mapping in order to verify the anomalies in the legacy data. If the data is found to be robust then drill targets can be rapidly developed. As per standard practice, the Company will commence initial community sensitisation prior to planned exploration and verification of gold anomalous zones identified from the legacy data.